The best known is the Game Changer barricade bag. 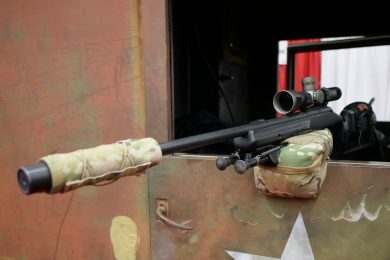 The game changer was invented to allow an individual to perfectly balance and support a rifle in field shootingscenarios. The size, shape, and fill material were designed to conform to uneven or irregular shapes. This makes it possible to balance a rifle on the edge of a hunting blind, car window, tree limb, fence post, cattle gate, dog house or outhouse. You can use this bag literally anywhere to help you get a stable shot. From personal experience, the game changer has enhanced my ability to make long-range precision shots with my rifle. It’s not a replacement for solid fundamentals, but it does decrease the amount of time it takes me to get stable in unorthodox positions in the field. Yes, it’s one more gear item to add to your pack, but well worth the trouble in my opinion.